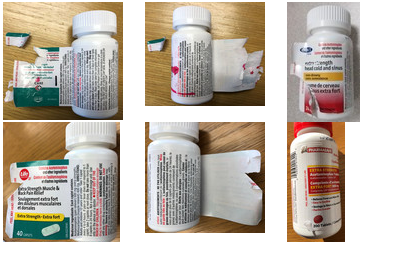 Vita Health Products is voluntarily recalling several store-brand (Care+, Exact, Life, and Pharmasave) over-the-counter drugs used for pain or sinus relief because of a labelling issue. Consumers may be unable to peel open the wrap-around label on the bottle to access the warning statements, or the label may not peel off completely, which may make it difficult to read some of the important safety information. This issue is the result of a label manufacturing defect affecting some bottles and does not affect the safety or effectiveness of the product in the bottles. The labelling defect means that some consumers may not be able to access important safety information, such as warnings and instructions for product storage. Consumers who have bought the affected products listed in the table below.